Are You Sitting Down for This? This Bevco Value-Line Ergo Chair is Just $129! Save 32% off the MSRP on Bevco V7 Value-Line Series Black Ergonomic Pneumatic Polyurethane Chair w/Hard Floor Casters and 22.25"-32" Height Adjustment (Q Source SKU: B047-000654) when you use our FPF071814 Coupon Code. This Featured Product Friday (FPF) promo is valid from today, July 18, 2014 through Sunday, July 20, 2014. 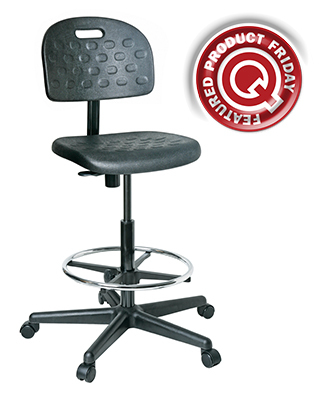 The Bevco V7 Value-Line Series Black Ergonomic Pneumatic Polyurethane Chair w/Hard Floor Casters and 22.25"-32" Height Adjustment (MFG Part Number: V7507HC-BK) features a waterfall seat for improved leg circulation, a tilt back w/adjustable tension control, a sturdy five-legged base, pneumatic seat height adjustment, and a contoured back w/a durable back pack. Regularly listed at $191.00, but with our FPF code savings you’ll get it for just $129.00. While this is a 3-day limited-time price, the coupon is unlimited. Use the code as many times as you like while it is valid—and please feel free to share the code with your friends & colleagues, too.